The active fault-tolerant control approach relies heavily on the occurred faults. Higher performances and more rigorous security requirements have invoked an ever increasing demand to develop real time fault detection and isolation system. The problem of fault diagnosis using analytical redundancy (model-based) methods has received increasing attention during recent years due to the rapid growth in available computer power. The main objective is to design and maintenance a fault-tolerant control system which guarantees a high overall system reliability and dependability both in nominal operation and in the presence of faults. Such an objective is achieved by a control performance index, which is proposed based on system reliability analysis. The methods involve generation and evaluation of signals that are accentuated by faults that have actually occurred. The procedures for generating such signals, called residuals, are based on two main distinct approaches. Direct approach consists in the elimination of all the unknown variable , keeping input-output relations involving only observable variables. Indirect approach estimates states, outputs or parameters in order to generate discrepancy signals obtained by the difference between the actual variables and their estimates. Harvesting rain-fed chickpeas (Cicer arietinum L.) from fallow fields in developing countries is currently a manual process performed by laborers in a tedious manner at a low level of efficiency. A tractor-pulled harvester was built in which a chain conveyor transfer harvested material. A tractor-mounted harvester was then redesigned, which incorporated a modified stripper header to detach pods from the anchored plants together with a pneumatic conveyor mechanism. The resulting machine benefitted from being light-weight and having good maneuverability. Reduction of total losses from over 50% to close to 25% over a seven-year period confirms the potential of the prototype for commercialization. 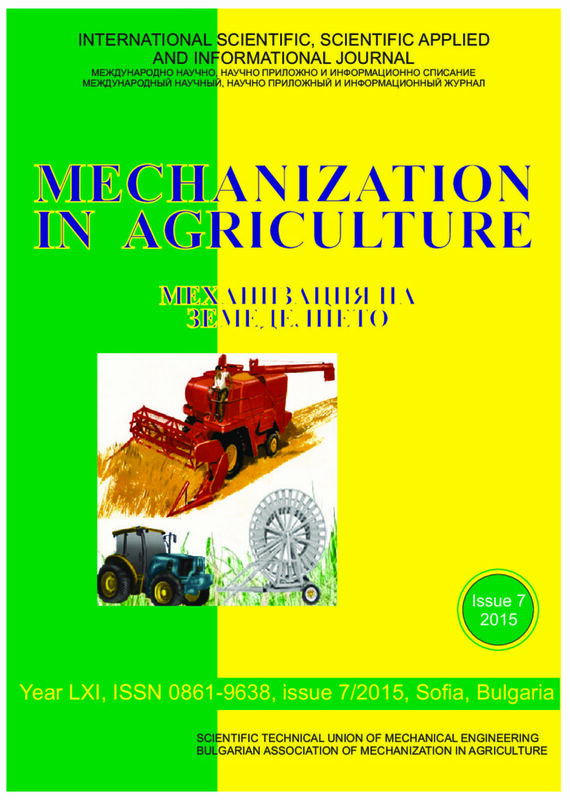 The paper presents the development of pneumatic grain drills adapted to the local conditions of Northern Kazakhstan. They have simple structure, low cost and high flexibility, high productivity, low power consumption and can be aggregated to a wide class of tractors from 1.4 ton to 8.0 tons. The paper considers priority goals of future sustainable development and assurance of food quality and safety in agricultural and food sector and underlines the necessity of establishment of Agricultural Knowledge and Innovation System (AKIS) in Bulgaria based on a production model with market-focused technology development system. Knowledge-based economy, and particularly the searched increase in competitiveness in agriculture and food industry, could be reached by creation and distribution of knowledge and innovations among stakeholders and networking. The establishment of such a technology development system would incorporate three main elements: measurement of inputs, market-focused technology development and information systems. It would foster rural development through knowledge exchange between stakeholders in support of production, marketing and processing of agricultural and food products, as well as natural resources management. AKIS is a framework embracing all the actors and their interactions in creation and transfer of knowledge in new and effective ways.